We loved the 6 floors (with elevator) & enjoyed all the extras of the house. Saw lots of the sights of Puerto Rico Rain Forest, Dry Forest, San Juan, Bio-Bay. The best part of our trip was missing the 7 inches of snow and single digit temps in Ohio. Loved the sun & Sand. Thanks for sharing your home! We too had a wonderful time! Cant say enough about the beautiful beached, views, restaurants and just everything! Beautiful home! Love to stay here again! Great time in a beautiful home. It had all the views as promised in your ad!! Loved all three beaches!! Hope the golf ect is up and running again soon! Maria, Thank you so much for a wonderful get-away in your home. Four families enjoyed the comforts of your home and the surrounding areas. We would like to thank you personally for all your help. Thank you so much for allowing us to vacation in your beautiful home! Your accommodations truly made us feel right at home! The views are absolutely breathtaking. We enjoyed having our own private pool and the golf carts were the highlight of our childrens vacation! Thank you again for a wonderful time! To our beautiful friends Our family, Thank you, Marcos and Maria, for sharing this amazing place; this paradise with us that you call home. We truly feel at home when we are here and want you to know that the invitation for you to visit and stay with us in Louisiana is open to you and only one phone call away. You are always welcome and with open arms and heart! Marcos, Maria, Dennis, Marc, Mommie, Poppie and all others in the Pentol Family, you are loved by Richard and myself and that will never change. Thank you for sharing your home(s), your beautiful extended family, and insight into a Puerto Rican lifestyle. We love you all! Maria, of all the Gin Joints in the world, yours is the best. Lesley & I had the best time in your comfortable house, but of greater joy to us is our joy in knowing you, your family, and our friendship. We will be returning to this great place soon! Maria, We had a wonderful Puerto Rico vacation. Your beautiful house was the perfect home base for the 6 adults & 2 children over 8 days. We greatly appreciated all of the children friendly amenities and beach toys. The open setting and decoration is relaxing and of course the view from every window is breathtaking. Thank you for your hospitality we will recommend you to our friends. Well we leave today and wish we had another week. Definitely need 2 weeks to see and enjoy everything Palmas has to offer. We had teenagers and a 6 year old and they were always busy either in the pool or going to one of the many beaches. We will be back really soon. I am starting to plan our next stay. Perfect picture views! A must see is the rainforest. Thanks for letting us use your property. We had a blast! We too enjoyed this lovely property. The beaches are spectacular and everyone loved the Beach Club. A wonderful Spring Break indeed! Two families shared your lovely villa 4 adults & 6 kids! We loved hanging on the beach at the Beach Club- as well as shell seeking at your neighborhood beaches. Having access to the golf cart was terrific! 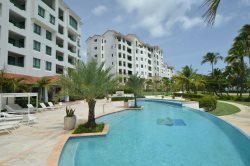 This part of Palmas del Mar is the prettiest you are so lucky to have this spot! Thank you for sharing with us. Were leaving a few extra kitchen supplies And, taking with us some very happy memories!! Dear Maria, Thank you for a wonderful week! Our group if 5 adults and 5 children had a blast in your villa. Our stay was restful and rejuvenating. Your villa was comfortable and spacious. We are already planning our next trip. Our family of six adults & 3 toddlers had a wonderful vacation at the Palmas Resort. The villa was well appointed and had plenty of space for all. Maria was prompt to handle any issues that came up and was a pleasure to deal with. Everyone loved the cove beach which was so easy & quick to get to, particularly with the golf cart. Thanks! Thank you so much! This house was beautiful and a perfect family destination. Being here was like a dream. It was beautiful and so much fun. Spending my birthday here was a pleasure. I loved staying here it was so nice staying here. There is a pool in the backyard, beach two blocks away. Beach club 3 blocks. This house is six floors, huge house. My grands had a great time! Thanks for everything! Maria, Thank you so much for allowing our family to stay in your home. We enjoyed a wonderful ten days in this house. The views are so beautiful! We enjoyed the private pool and the private beach about 5 minutes walking- it is great and nice. We had fun! Thank you so much! We spent two wonderful weeks with our family and this home was perfect? Plenty of room for all of us and excellent for entertaining. We hosted a party with over 60 guests and there was lots of space for all! However the best part of all were our gracious hosts Maria Eugenia, Marcos, Dennis & Marc Jr. They are absolutely like family and made sure any issues were taken care of immediately. This is definitely the Best Kept Secret in Palmas! We will be back! A wonderful Palmas, PR, stay! Maria & Marcos are the most accommodating hosts one can imagine. Feel like family. Hope to be back soon! Our family truly enjoyed our stay in this beautiful villa. Maria was very responsive to all of our needs and all of us felt very comfortable throughout our stay. We enjoyed a 4-hour trip to Vieques with Captain Matthew out of the marina and although the surf was a bit choppy, did some snorkeling and explored the beach. It was always wonderful to be able to return to your wonderful villa by the sea. Thank you Maria! Maria Eugenia, Gracias por permitirnos disfrutar de esta villa tan Hermosa y tan acogedora. La vista es espectacular tanto hacia el mar como hacia el pequeo bosque en la parte de atras. Tanto nosotros como nuestros amigos estamos muy felices de haber podido compartir este fin de semana en Palmas del Mar. Gracias! Happy Thanksgiving! Thank you for letting us stay in your beautiful home. We all had an awesome 6 days in paradise! There was not a better way to celebrate our 4-th wedding anniversary than with our whole family! All 8 of us are leaving here with so many beautiful memories. Many laughs and enough sun to make it through our long New England winter! Thanks again! Maria & Marcos, thank you very much for a wonderful stay! We enjoyed the beach down the street as well as the one at the Sheraton. Dinner at Tapas was very good. The rainforest was spectacular as well as dinner on our way back at Sandys. Thanks again! Thank you for sharing your beautiful with our family. It was an unforgettable experience for all of usour children were welcomed and we were very comfortable at all times. This was for sure the best choice to have this reunion. We hope to see you soon and to enjoy your hospitality. Thank you once more! Thank you so much for sharing your large, lovely, luxurious home! This has been a perfect vacation for our family and we plan to return soon with our extended family. The amazing views of the ocean and of the private beach cove greeted us each morning and energized us during the day. The large kitchen made cooking meals fun and economical. The beach in Palmas del Mar is beautiful and the golf cart made getting to all of them easy and fun. Our visit to El Yunque was a high light as well as our snorkeling trip to Vieques. Mil gracias, de nuevo, por su hospitalidad y la invitacion de estar en un ambiente tan bello. Maria and Marcos were wonderful hosts sharing their beautiful home with us and being available at all times. We loved staying here. The location is fantastic and the views are breathtaking. We enjoyed our vacation in Palmas del Mar especially eating the Puerto Rican food and our trip to El Yunque.